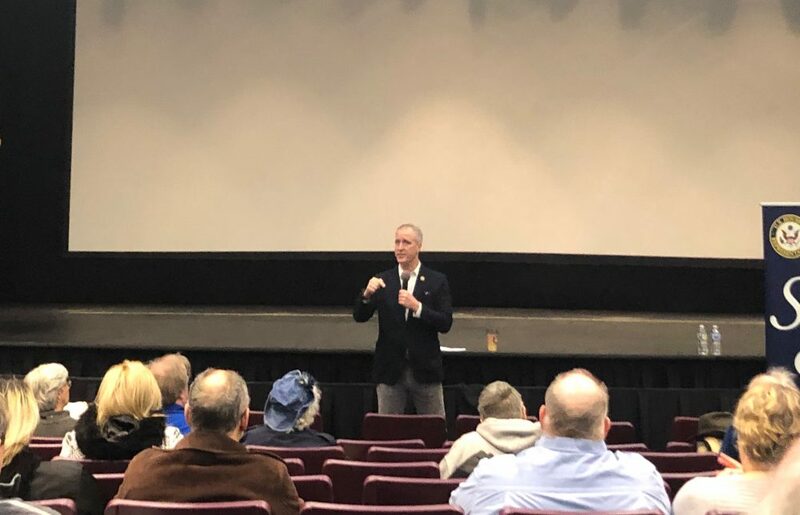 While the government shutdown may officially be over, residents who attended Rep. Sean Patrick Maloney’s town hall on Sunday in Putnam Valley were deeply divided on issues regarding immigration and border security. Throughout the hour-long forum at Putnam Valley High School, topics involving senior care, the federal government and local issues were discussed, but nothing elicited more emotion than immigration with attendees receiving either boos or cheers from the divided crowd. Resident Chuck Tressler said he was concerned with undocumented immigrants being able to obtain a driver’s license or identification card after explaining the lengthy and detailed process his mother and son had to endure obtaining a renewed license at the Department of Motor Vehicles. Others expressed disdain with House Speaker Nancy Pelosi for not complying with President Donald Trump’s proposal to build a wall along the US-Mexico border, immigration reform and illegal immigrants not contributing to the tax system. While Maloney had to remind attendees to respect each other’s opinion more than once, he also took aim at Trump’s decision to shut down the government for more than a month. Key parts of the US government shut down on Dec. 22 after Trump and Democratic politicians reached a standstill over Trump’s petition to spend $5.7 billion in funding for a wall along the US-Mexico border. The shutdown affected more than 800,000 federal workers who were either required to work without pay, furloughed or placed on temporary leave. Following a 35-day shutdown, Trump announced he had reached a tentative deal with congressional leaders on Jan. 25 that will fund the government for three weeks. In a statement following the agreement, Maloney said the shutdown was pointless and only hurt people and weakened the country. “Now that the lights are back on, we can have a serious conversation about additional border security,” Maloney said in a statement. “I am hopeful that we can come to a bipartisan agreement on what having a ‘secure border’ means and how we can achieve that worthwhile goal.” Maloney said that he voluntarily didn’t take a paycheck during the shutdown, adding that he and other members of Congress are looking to pass legislation that would restrict Congress from getting paid if the government shuts down again. While Maloney said he didn’t expect the government to be shut down for more than a month, he asserted that members of Congress agree when it comes to border security, explaining that millions of dollars has already been spent on securing the border. He explained that the solutions to immigration and border protection aren’t complicated and many in Congress are willing to do what makes sense and benefits everyone. Maloney added building barriers doesn’t benefit local municipalities with problems that need specific attention. The Democratic politician said that he is committed to serving his constituents and being a reasonable voice for expending funds where it’s really needed.